A challenging course with an abundance of climbing, combined with high temperatures, separated the wheat from the chaff at the sixth round of the UCI World Cup Cross-country series presented by Shimano. 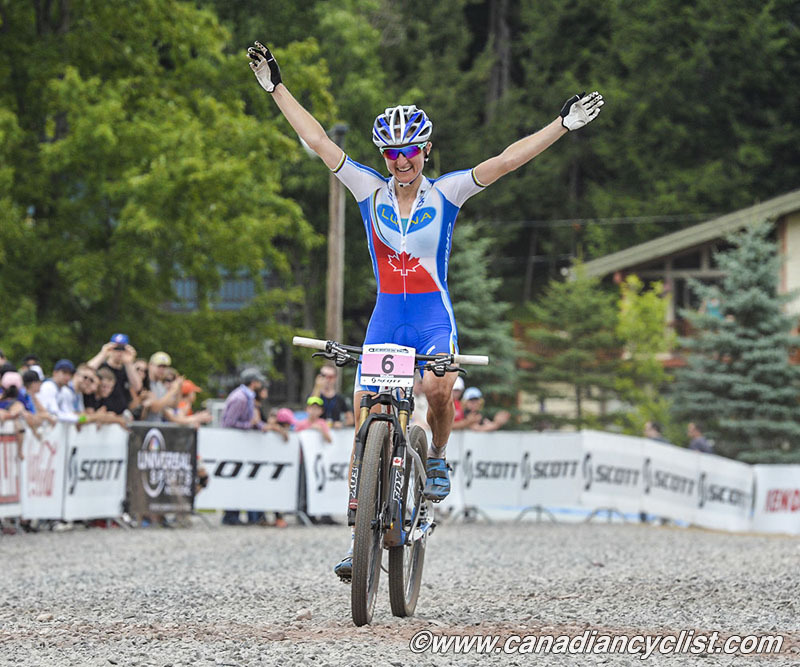 Canadian champion Catharine Pendrel (Luna Pro Team) gave notice that she is reaching top form by winning the Elite Women's race, while Nino Schurter (Scott-Odlo) used his descending skills to hold off Julien Absalon (BMC) to win the Elite Men's category. Jolanda Neff (Liv Pro XC Team) secured the overall World Cup win with a fourth place result, while Absalon needs only a top-28 result at the next (and final) race to do the same. Hosting a World Cup for the fourth time in five years, the 4.5km Windham, NY, course was heavy on climbing, winding it's way up the Windham Mountain ski slope before a quick drop back to the finish. As it's been for most of the season, Schurter and Julien Absalon were the main protagonists, with Schurter coming out on top, thanks to being faster on the descent. With one race remaining, Absalon remains overall World Cup leader, with only a top-28 finish at Meribel needed to win the series. Canadian champion Geoff Kabush (Scott-3Rox) had a very good start, briefly leading the field, but by the top of the climb it was Schurter, Absalon and Mathias Flückiger (Stöckli) on the front, followed by Trek Factory teammates Sergio Mantecon and Dan McConnell, Manuel Fumic (Cannondale), José Hermida (Multivan Merida), Henrique Avancini (Caloi Team) and Portuguese champion David Rosa. Riding in the mid-twenties were Scott-3Rox teammates Kabush and Derek Zandstra, with Raphaël Gagné (Rocky Mountain Factory) a bit further back. The situation was fluid for a lap as some early rockets were jettisoned, but by lap three the front of the race had split into two groups, with Absalon, Schurter and the Flückiger brothers ahead, and McConnell, Mantecon, Fumic and Stéphane Tempier (BH-Suntour-KMC) ten seconds behind. The leading quartet came apart on the following lap, as Schurter and Lukas Flückiger pushed the pace on the descent, putting Absalon and Mathias Flückiger on the back foot. The World Cup leader was able to move into second and reduce his disadvantage on the climb, but he was unable to close the gap, allowing Schurter to slowly increase his lead. Riding a full-suspension 650b bike, the world champion gained time on the descent while keeping Absalon in check on the climb to claim his second victory in two weeks. 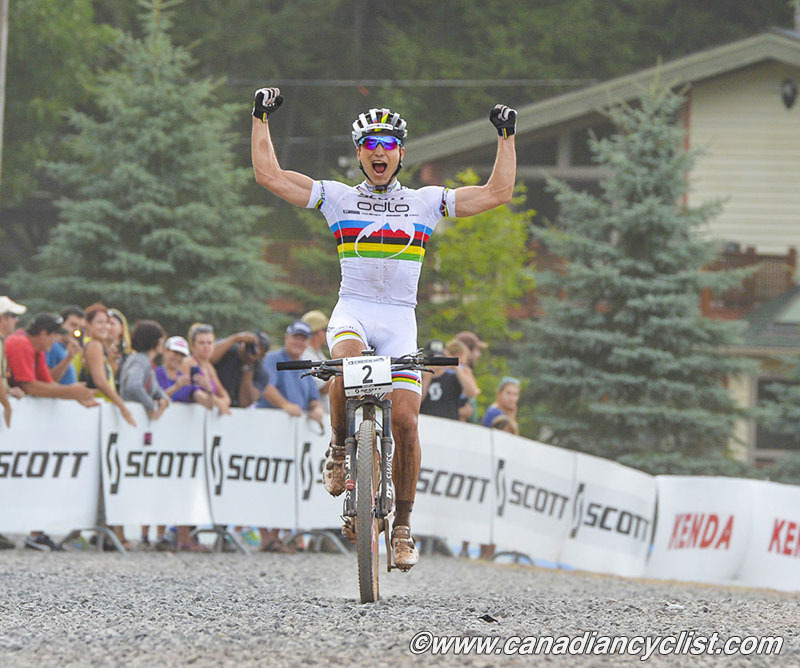 "It was a hard battle with Absalon," explained Schurter. "I would say I made it in the downhill. I had quite an advantage with the full-suspension. I was always able to open the gap, maybe 10 to 15 seconds. I tried to hold it on the uphill. It was definitely hard but I'm super-stoked to win here on a course that maybe doesn't suit me best." "It's good for the overall," said Absalon of his second-place finish. "In the downhill I was slower than him. I said to myself 'Okay, it's not possible with my hardtail to follow him' so it's better not to take risks because if I crash or have a flat tire it's a really bad situation for the overall. I tried to push on the climb but I don't want to push on the downhill because second position is not bad for the overall. A crash or flat tire would be a disaster." Lukas Flückiger held off Dan McConnell for third, with his brother Mathias joining him on the podium in fifth. For their part, Kabush and Zandstra rode a very controlled race, gradually moving up to finish nose to tail in 12th and 13th, realizing Zandstra's goal of cracking the top-15. The pair co-operated throughout the race, adjusting their pace to ensure a strong finish. "We joked about it before the race and it ended up happening like that," said Zandstra of the team effort. "Maybe subconsciously we worked it out. I knew it was going to be a longer race and I didn't want to be hurting on the last lap. I knew that would be a big factor on this course because I've raced it a bunch of years and that always seems to be the case here." "I've been frustrated with bad starts and losing time," related Kabush. "I was lucky that it opened up and I got into the lead and rode some clean lines. As I drifted back Derek came up and it worked out really well. We were able to keep pushing each other and fighting for it. It was really great to push Derek and great to see a solid result." With 71st spot on the start grid, Evan Guthrie (Norco Factory) also paced himself well, moving up throughout to claim 44th. "Today was a hard one. Lots of uphill. The downhill was pretty easy stuff so it was a more difficult race for me. I wasn't feeling as on as at Mont Ste-Anne. I kind of rode into it; picked it up at the end. I wouldn't say it was great, but not bad." A slow leak plagued Gagné, who finished 53rd. Twice he had to stop to add air to his tire before it finally sealed. "Physically I felt a little off. I was struggling out there. It was a hard race. When it doesn't go very well and then you flat..." He will take a brief rest before resuming training in preparation for the world championships. The next World Cup at Meribel is not on his schedule. 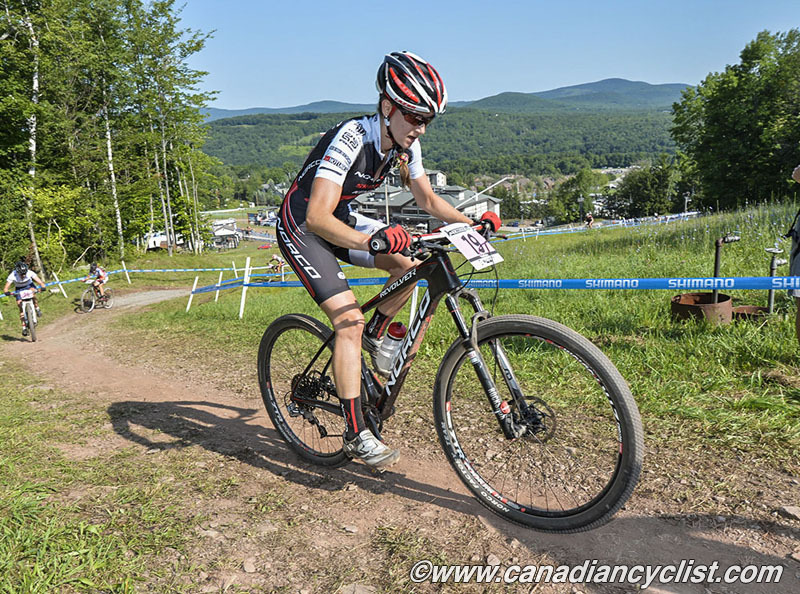 Riding a rising tide of fitness, Pendrel won her first World Cup of the season, and her fourth win in her last five starts (BC Bike Race, Nationals, Commonwealth Games, Mont Ste-Anne and Windham). She won here in 2012, but has had to deal with injuries in the interim, breaking a collarbone in 2013, and matching that with a fracture to the other one earlier this year. The Canadian and Commonwealth champion went out hard from the start, followed by World Cup leader Neff, who has won two World Cup races this year. The pair broke away from the field, but Pendrel dropped Neff at the start of the second lap and rode to victory. "I knew she was breathing really hard on the climb but she wanted to lead the descent," related Pendrel. "When she got in front of me on the descent I felt I had more pace and I wanted to see if I could get ahead and open a gap and I was able to do that." Neff dropped back and was passed by Annika Langvad (Specialized Racing XC) who held Pendrel at 30 seconds while at the same time fending off Tanja Zakelj (Unior Tools) and Blaza Klemencic (Feenstra Feltn p/b Kenda Tire). "It feels amazing," said Pendrel of her comeback from injury. "I'm really happy with the way my training has gone. It's unfortunate to miss those first two World Cups but in terms of the overall and my season it still worked out okay and I feel strong and that's important. It's always nice to have a stronger end to your season. You can come out blazing in the spring but if you don't hold it until the end..."
Zakelj gradually began to gain ground on Langvad, and a last-lap crash by the Dane saw her drop into third. Neff, meanwhile, had found her second wind and was on the move, but ultimately fell short, settling for fourth place, which provided enough points to take the overall. Langvad's crash occurred in a section known as Blackout, where the course transitions from bright, open field to dark forest. "You know the dark hole? Blackout something? My front wheel just slipped. It was really dusty and I went down." 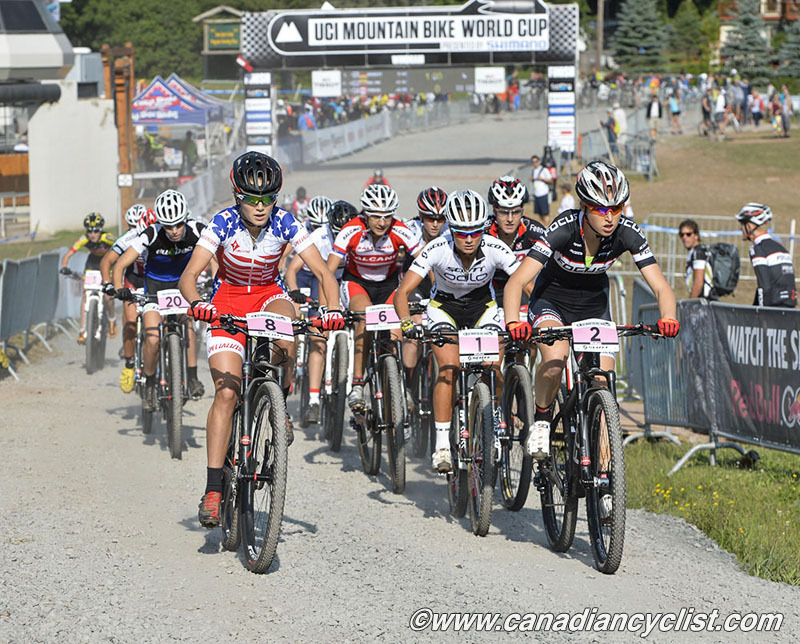 "Last weekend I went out way too hard and I died on the second lap," said Langvad of her race at Mont Ste. Anne. "I knew this weekend was all about staying within my limit because I'm building up toward the Worlds in Norway. I know that I can't afford too many of those surges so there was nothing for me to do but stay in my rhythm. I'm pleased with third. I'm so stoked." Neff didn't second guess her decision to try to ride with Pendrel: "It's always good to try and follow but I had to take it easier then for a couple of laps. In the end I could go faster so it still felt good. I didn't know they were that close but then I saw them in the last uphill and I thought 'Gosh, I can catch them' and I went full out and gave everything I had and came really close but didn't quite make it." Emily Batty (Trek Factory Racing) started conservatively, cresting the first climb in 14th position, but worked her way up to finish in 8th. "I had a typical start, I suppose. I definitely moved up mid-race and toward the end I was reeling in a lot more women and was able to get by." "Eighth is not quite what I was after but it's enough points to hold third overall. [Note: Batty actually dropped to fourth] I was feeling okay. More like high tempo - a lot of throttle but not punchy like I was looking for. I was able to stay cool with the heat out there and ride smooth. I was looking for a top five for sure; more so top three." 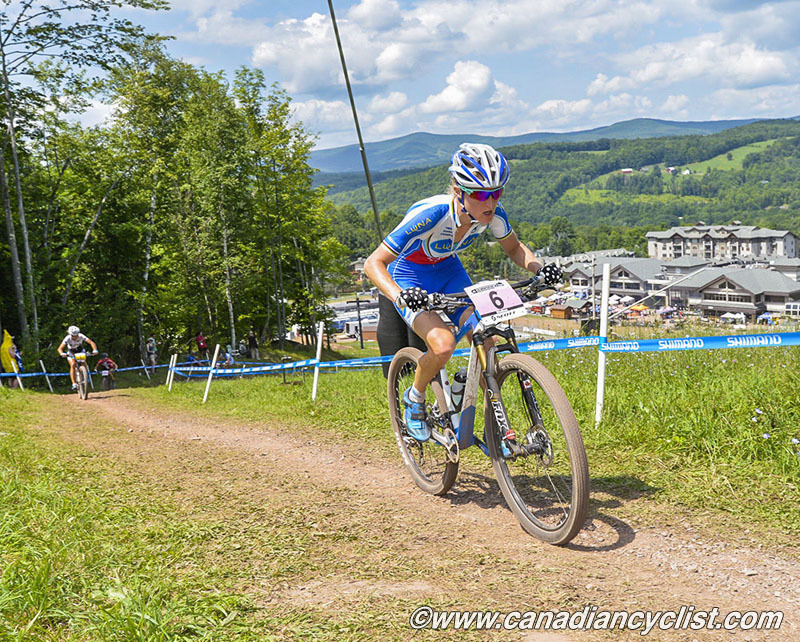 Starting from the 31st spot on the grid, Sandra Walter (LIV/Giant Canada) had a steady race to finish in 20th position, not quite what she had hoped after her best-ever 13th place result at Mont Ste-Anne. "I'm definitely satisfied. It was a battle out there and it was really exciting. "I was trying not to be complacent where I was and to keep my eyes forward and move up. My start wasn't the best and I had to really focus on moving up on the climb. Obviously after last weekend I was hoping for something similar but I have to be realistic and focus on it day by day." Jordan Sarrou (BH-Suntour-KMC) was the class of the U23 men's field, dominating from the start on his way to victory. The World Cup leader gapped the field at the start before waiting for them to catch up, then leading a line of riders up the first climb. Sarrou was joined by Anton Cooper (Cannondale Factory) in a move on lap two, but the Commonwealth Games gold medalist had to back off the pace, allowing Sarrou to build up a 30-second lead on lap three. Behind Cooper a chase group of five formed, containing Julian Schelb (Multivan Merida), Grant Ferguson (Betch.nl Superior), Michiel van der Heijden (Giant Pro XC Team), Bart De Vocht (Goeman - Scott Cycling Team VZW) and Howard Grotts (Specialized Racing XC). Sarrou was on fire and took the win by 41 seconds over Cooper, who is on form after winning gold at the Commonwealth Games less than two weeks ago. The chasing quintet eventually fractured, with Ferguson managing to take third. The winner had plenty of energy for his final lap, throwing in some whips on the final downhill and pulling a one-handed wheelie after the finish line. "The long climb is so difficult," sad Sarrou, "but I like to climb like that. On the downhill I took a lot of pleasure. I'm so happy to lead the course and wear the leader's jersey. I would like to lead the course directly. I took 40 seconds with Anton Cooper, and after I kept it in a big gear." 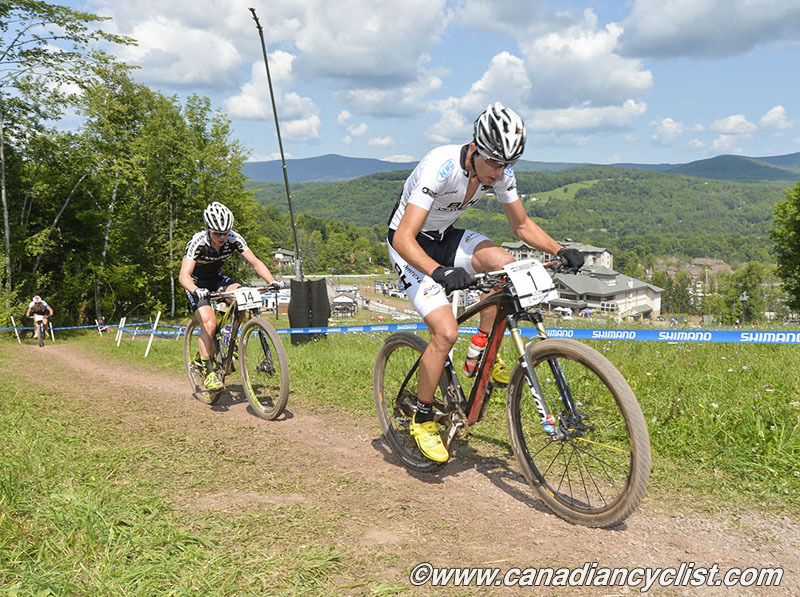 Mitch Bailey (Trek Canada) and Evan McNeely (Norco Factory) both had very good starts to join Léandre Bouchard (Cyclone d'Alma/Devinci) in the top 15 on the opening lap. Despite technical trouble, national U23 champion Bouchard paced himself to a strong eighth, while Bailey battled with South African James Reid to come home in 12th, tying his World Cup best. McNeely faded a bit to finish 21st. "This is a long climb and you have to be consistent in the race," explained Bouchard. "I started conservatively and followed wheels, trying to climb every climb at a consistent speed. On the second lap I had a little crash on the Miniwall section (a technical descent with at least three options). I slipped on the berm and the lockout on my fork broke so I did the rest of the race on a locked fork, but it was okay. I just worked more with my arms." "This course is really open on the ski hill so we got the sun right on our backs," commented Bailey. "There are a couple of sections where, because it's so bright, it goes to pitch black, but you kind of like those sections because you're out of the sun for a second. But definitely a relentless course; super-hot with a lot of climbing. James Reid and I were dangling behind the top-ten; you get a bit closer and fall back, get a bit closer - fall back. I'm pretty happy with the result." "I was more pleased with my start this week than last weekend," stated McNeely. "Last week I had a terrible start and I was able to move up. This time I was in the top-15 and had to fade a little bit. I just did the best with what I had today. "It just wasn't quite as good as last weekend. Congrats to Mitch on moving up, definitely a strong ride for him. It really was a good race for me. Last week was awesome, this week was normal." American Kate Courtney (Specialized Racing XC) led the field off the line, but it was the quartet of Jovana Crnogorac (Salcano Alanya), Jenny Rissveds (Scott - Odlo), Margot Moschetti (Scott-La Clusaz) and Yana Belomoina (Betch.nl Superior), who reached the top of the climb first. Rissveds crashed on the descent while trying to pass, breaking her saddle. After a new saddle and seatpost change in the tech zone she was able to resume, but was over a minute behind. Moschetti made her move early on the second lap, opening a 25-second gap by the upper feed zone, which she extended slightly on her way to the win. Belomoina, winner last week at Mont Ste. Anne, hung on for second ahead of Crnogorac, while Rissved's comeback attempt fell a tantalizing five seconds short. 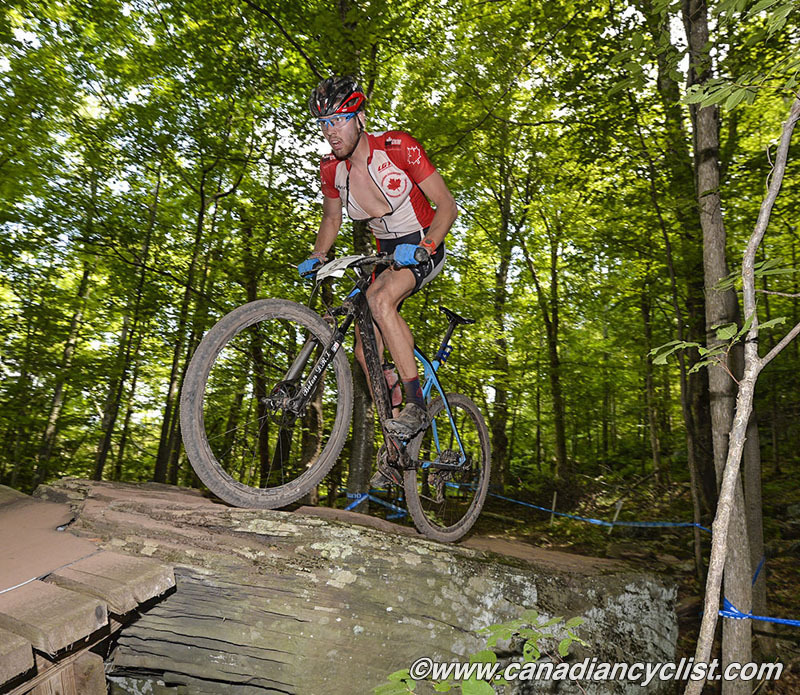 "The course is good for me as it suits my strengths," stated Moschetti, second at Mont Ste. Anne. "I went off the front because I wanted revenge from last week. I just went hard and didn't look back." Rissveds took the blame for her crash: "I was faster than the girls in front of me on the descent. It was just stupid. I wanted to be in front of them but we were together so there's no reason to pass them. I tried to go faster than them on the last downhill before the finish on the first lap and I went out of the line and the front wheel slipped away because it was so loose there on the inside. I broke the saddle in the crash." "When something like that happens you always get stressed, you lose time in the tech zone and you lose time because it gets in your head. On the second lap it felt quite bad actually. On the third lap I went faster again, could go strong, and on the last lap my saddle slipped and the angle on the saddle went up, but I don't think I lost that much time with that. There's always something that stresses you. It was bad luck today but I felt pretty strong actually." 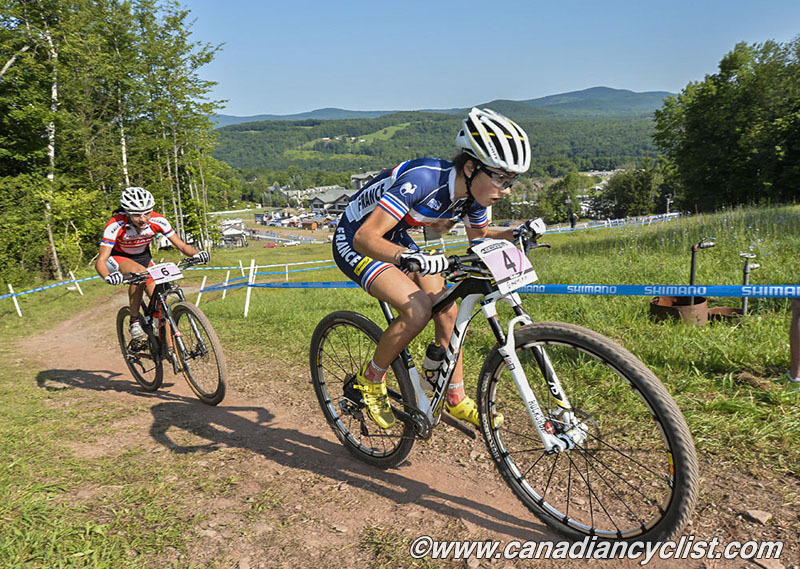 Haley Smith (Norco Factory) was the top Canadian in ninth, bettering her Mont Ste. Anne result by one spot. "I'm pretty stoked to have two top tens. I'm going to Meribel [World Cup Final] in a couple of weeks so it feels good to lead into that with a good start position and the confidence these races have given me." Asked if she thought climbing was her forte, Smith replied: "I didn't think it was, but I guess I'm getting better at climbing. The bike is really light this year - the 650 - it's got smaller wheels. I feel like it just sort of floats up the climbs. Maybe it's a bit fitness, a bit the bike, but I feel really fit so I guess climbing is easier when you're fit. I guess it's becoming a strength, yeah. We were really lucky. We had support at the top feed zone with really cold water to dump on ourselves. That was awesome ripping down the descent with the wind hitting the water on your chest." - Julian Absalon's newest bike, equipped with Shimano's wireless Di2 group, was stolen prior to his race at Mont Ste. Anne. "It was bad news because it was my race bike. It was stolen from the airport. My mechanic checked it in at the Zurich airport with all the Scott and BMC team bikes. There were 12 bikes checked in, but at Montreal there were only 11. One bike was stolen. There was a sign of the bike in Montreal, but after that we don't know what happened to it." - Pendrel talked about maintaining her form through to Worlds: "It's a real balancing act. I did some solid training earlier in the week - I did five pretty hard laps here on Wednesday. You need to respect the racing and get some good recovery in before and after the races, but on your training days you need to train pretty hard and look at what feels like you might be missing in your races, and make sure you're addressing that and just carry your momentum." - Batty is also looking ahead to Norway: "You'll see (my form) pick up again in a few weeks time. We're going to do an altitude training camp in preparation for Worlds, which has a bit of elevation in Norway. I go to Meribel tomorrow to get familiar with the European time zone and get on the track, and then head over to Worlds."